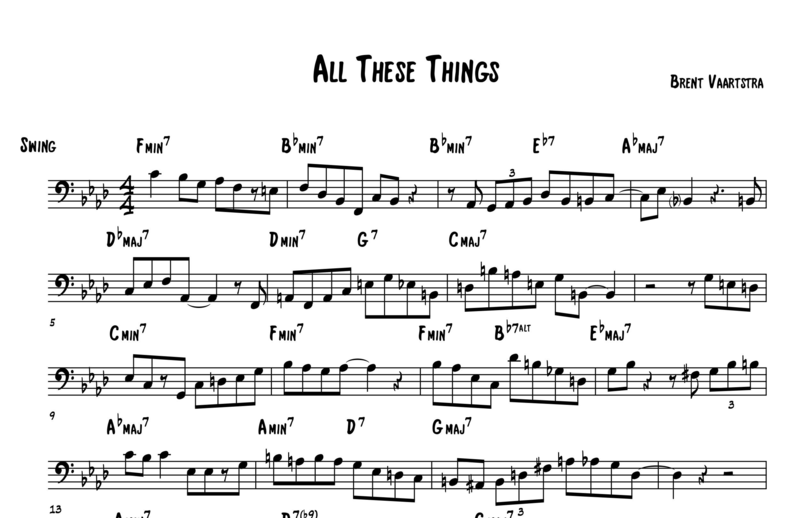 All The Things You Are is a popular jazz standard by Jerome Kern, and is one of those songs that every jazz musician needs to know. It’s often called at jam sessions and gigs and has a lot to teach us about music and jazz harmony. Because of its popularity, All The Things You Are is often on the short list of songs that beginners should learn. However, this song is not very beginner friendly. It has an advanced harmonic structure with lots of twists and turns. With swarms of chord changes going by and movements into five different key centers, this standard can be quite a challenge to improvise over! But despite its challenges, like all things, it can be simplified. Let’s walk through this tune together, analyze it, and explore ways to approach our improvisation. For the sake of demonstration, this will be quite methodical. It doesn’t have to be this way every time you approach a new jazz standard. However, it can be helpful to break things down this way. 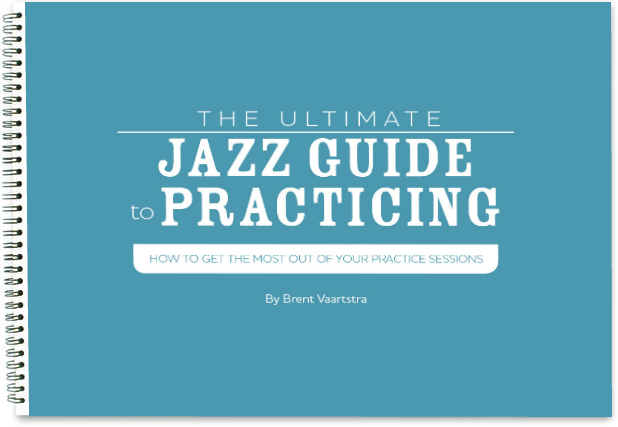 We go over this kind of stuff and much more in my eBook The Jazz Standards Playbook if you want to get further help. 1. Listen to the tune. I know this is not ground-breaking new information, but it’s easily the most important step. Believe it or not, I find that a lot of students immediately go looking for sheet music or improvising tricks before even familiarizing themselves with the song. The best thing you can do as a jazz improviser is to listen. Listen to lots of different versions of the song and saturate your ear with it. This is an important step, but mostly common sense, so let’s move on. 2. 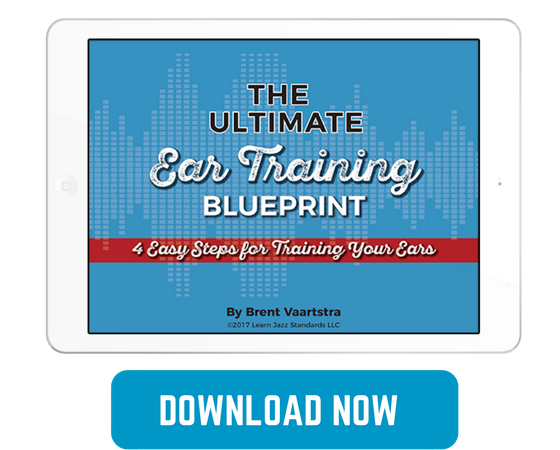 Learn the melody and chord changes by ear. If you follow our blog or podcast, you know that we preach learning jazz standards by ear all of the time. Don’t go straight to the sheet music! It should be your last resort or your final check of your work. How is this going to help you improvise over this song? Obviously, you should know All The Things You Are before you attempt soloing over it. If you don’t know it, how can you truly improvise over it? Also, by learning it by ear, and not with sheet music, you are exercising your ear. The most important aspect of becoming a great jazz improviser is having a great ear. Developing the ear comes with practice, and the best way to do that is to learn jazz language by ear. Do the work, and it will pay off! 3. Map out the song. 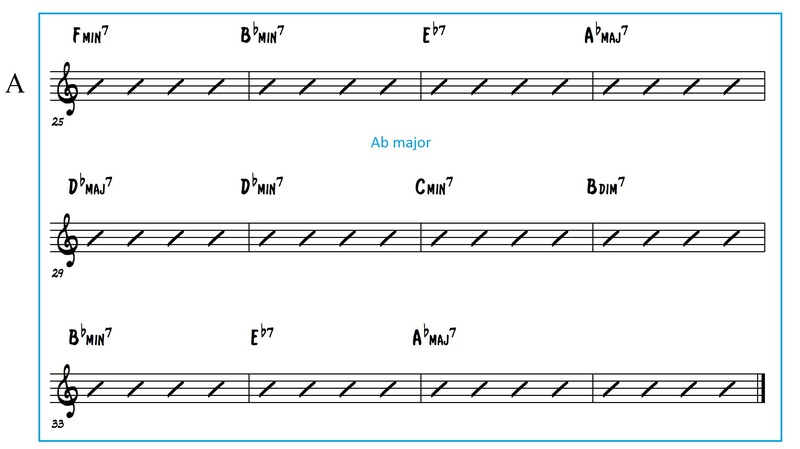 To become a great jazz improviser, you need to understand jazz harmony. We need to analyze the harmonic structure of All The Things You Are. That means looking at what chords and chord progressions we are dealing with, how they relate to each other and where they lead to. 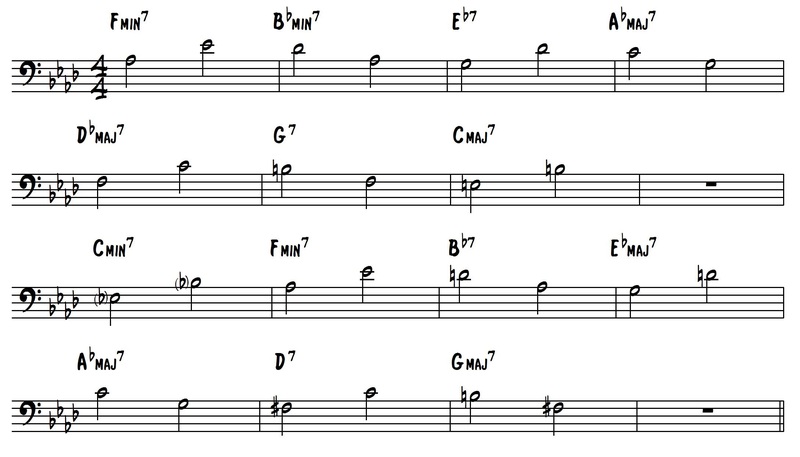 To start, let’s take a look at the chord changes and then we’ll dig in a bit further. Step 1: Define the harmony. ATTYA has a 36 bar form. ATTYA has an AABA form. AABA form simply means we are organizing the song into 4 sections. For the sake of this song, it would be better to label it: A1-A2-B-A3. The A sections are all similar but each one has a variation that makes them different. The B section is unique to the A sections. Take a look at the different sections and identify the differences and the similarities. So now we have defined the harmony. To you, this may just look like a lot of chords. What do you do with it? In the next step, we need to simplify it. Step 2: Simplify by defining the key centers. As I’ve already mentioned, and hopefully you’ve noticed, All The Things You Are does not stay diatonic to one key center. 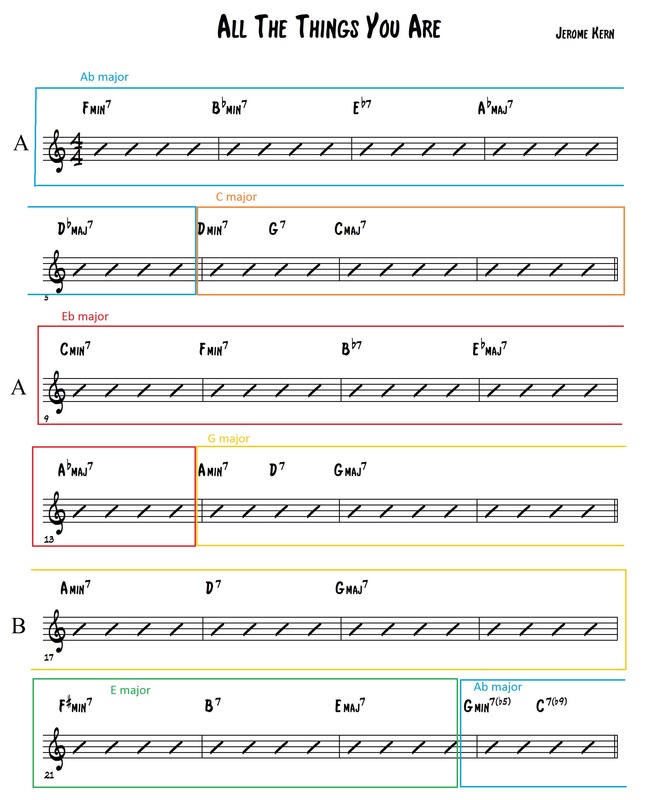 The tune is essentially in concert Ab, but it navigates to 5 different key centers. It is best to think of this song that way, rather than try to relate every single chord to Ab. As you can see, I have color coded the key centers. I want you to realize that even if you just played a major scale corresponding to the given key center you are in, you will be playing notes that work. Please don’t get me wrong. Playing a major scale is not true improvisation, nor will it outline the chord changes properly, but this may help you start to simplify the harmony in your mind. Now, you may be looking at this and wondering how I know which chords are assigned to the different key signatures. That’s where a Roman Numeral analysis can come in handy. Step 3: Define the function of each chord with Roman Numerals. If you don’t understand how Roman Numerals work with analyzing chords, I highly suggest you open up this lesson in a new tab: How to Harmonize a Major Scale with 7th Chords. This explains how we come up with chord progressions and what each Roman Numeral means. The number of the numeral represents the scale tone it represents in the corresponding scale. Lower case or upper case defines the quality of the chord. If it’s lower case, it’s a minor 7, half-diminished, or diminished 7. If it’s upper case, it’s a major 7 or dominant 7. To help make this clear, I’ve circled all of the “I” chords that define the key centers in their corresponding colors that I assigned earlier. 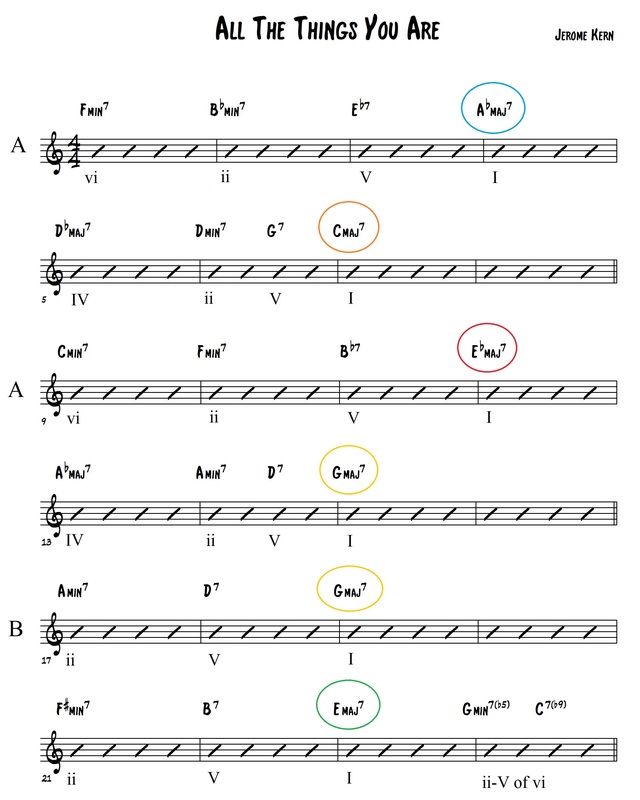 Take some time to look through this and confirm your understanding of each chords function to the key centers. Remember, understanding the harmony is essential for improvising over it with competence. Step 4: Define key chord progressions. Now, if defining the key centers helped us simplify the harmony, defining the key chord progressions will help even further. Looking through for yourself, can you find any progressions that repeat themselves? If you said ii-V-I, you nailed it. The major and minor ii-V-I are the most common progressions in jazz and All The Things You Are is almost entirely comprised of them. 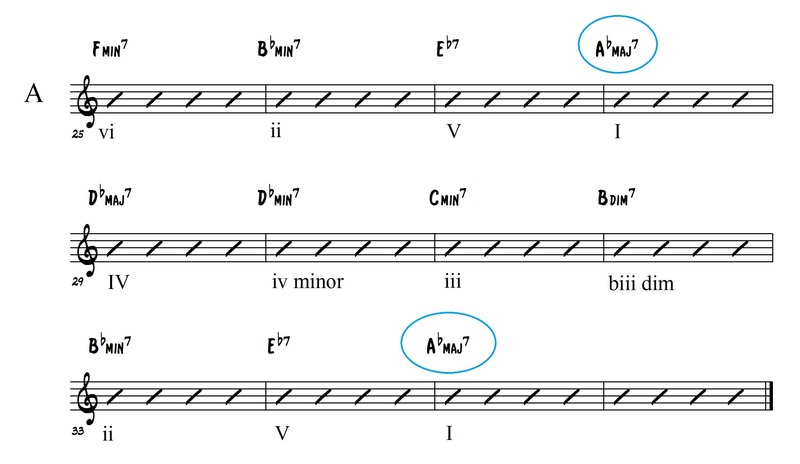 There are vi and IV chords separating them sometimes, but other than that everything is just ii-V-I’s (save for bars 29-32). 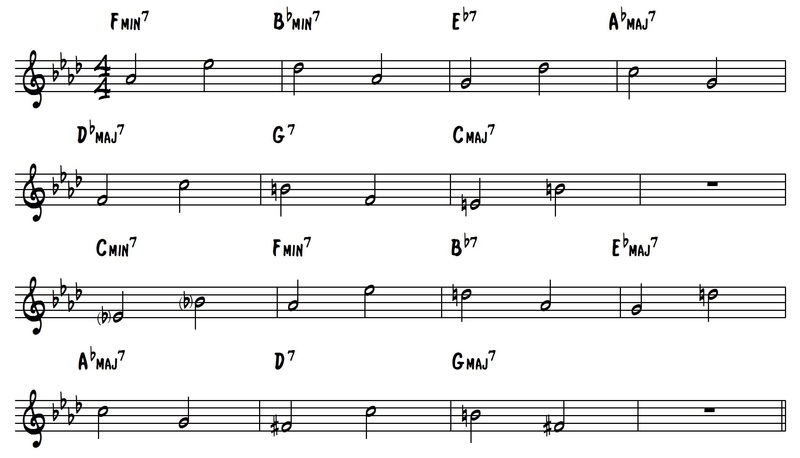 So would learning some ii-V-I licks and pieces of jazz language be helpful? You bet it would. The best thing to do is go to recordings of great jazz musicians and find ii-V-I licks that you like and learn them by ear. Not only will you know you are learning great language, you will be exercising your ear. What do you do with these licks after you’ve learned them? Take them into all 12 keys. Practice playing the licks over every ii-V-I in ATTYA. Make variations of your own. 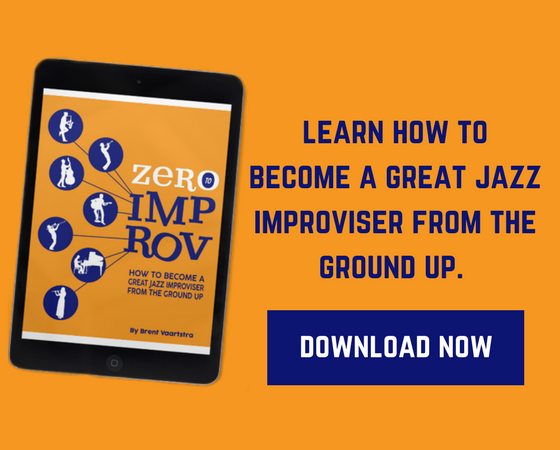 We have a whole lesson dedicated to this in our eBook Zero to Improv, a book that teaches you how to become a great jazz improviser from the ground up. But let me just quickly summarize the importance of 3rds and 7ths. These are the defining notes of every chord. If you understand how 7th chords are constructed, you will realize the differences between each are primarily the 3rds and 7ths. This means if you want to hear the difference between the chords you are playing, you will want to know what the 3rds and 7ths are. I’m going to take just the first two A sections of ATTYA from an exercise in the Zero to Improv book. Essentially, we are just defining the 3rds and 7ths of each chord. On each chord, we start with the 3rd and move to the 7th. What you’ll probably notice is when chords are moving in fourths (like they do in ATTYA) the 7ths resolve step-wise into the 3rd of the next chord. This is called voice leading, another concept that is talked about further in Zero to Improv. Step 6: Connect the dots by creating melodies. Ultimately, you want to start making some music, not just analyzing and breaking things apart. 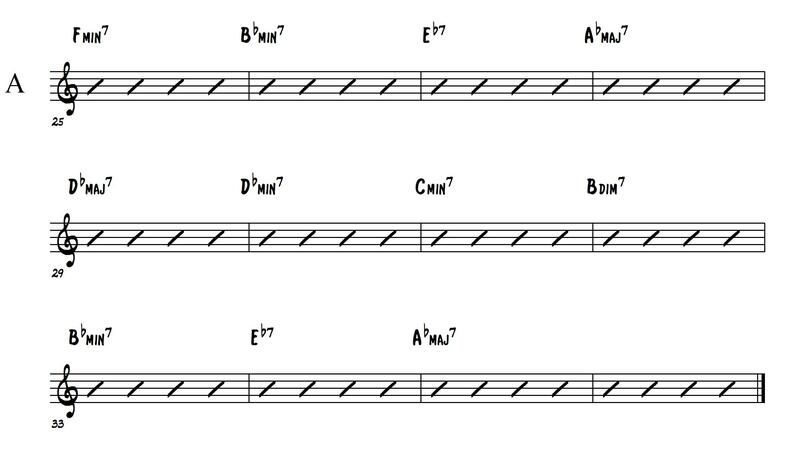 Though this is not true improvisation, it can be helpful to compose your own solo to try to connect the dots. Ultimately, improvisation is simply composition sped up. So practicing composition in its “slow” form can be a great exercise for becoming a great improviser. 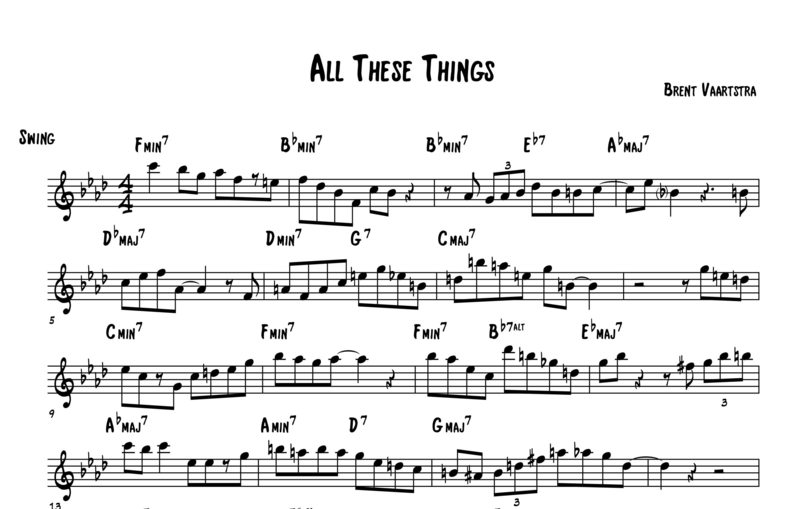 Here are the first two A sections from an etude based on All The Things You Are, that can be found in our eBook 15 Essential Jazz Etudes. This final step may seem obvious, but it’s important all the same. There are no shortcuts to becoming a great improviser. You need to be listening to the greats, learning the language, and analyzing it so that you understand the harmony. Turn on a metronome, play-along, or better yet, find a friend and get to practicing! The more you wrestle with these chord changes the better you will get. It’s all about becoming familiar with the tune and learning by trial and error. 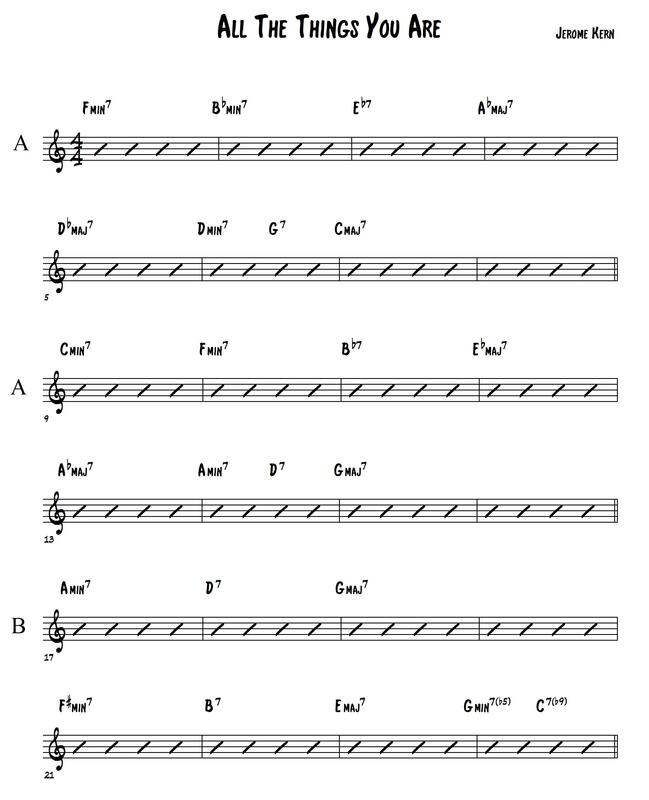 If you want more chords analysis and improv lessons over jazz standards like this, check out The Jazz Standards Playbook eBook and Companion Course. Best of luck and happy practicing! This REALLY helps me understand the process of analyzing a piece and hearing what is going on. Hi Brent, How did you determine the key centres in ATTYA? Actually, how do you determine key centres generally? I know ATTYA really well but am always looking for new ideas and yours will fit nicely into some of my improv patterns. Great advice for all improvisers would be to play along with the greats below the play alongs.